What a whirlwind Halloween! We had school parties, cousin playdates, and a Trick or Treat caravan yesterday. I thought it would be fun to share a few pics of my two little Halloween cats and their Halloween fun. Costumes were a melting pot of Target, Hobby Lobby, and Wal-Mart. I love that they can continue to wear their new leotards to ballet this winter! Finally, the big moment came around. Costumes were back on, cousins arrived, and the wagon was cleaned off for photo opps and neighborhood travel. It was so much fun to see the babies jostling around in the wagon, all bundled up with a blanket. My niece (dressed as a Fraulein) kept her Trick or Treat bag clutched in her tiny fist the whole time. We stopped at one house with a smoke machine and the girls started yelling "Stop, drop, and roll!" I guess they really paid attention to Fire Safety at school last week. I let the girls choose three pieces of candy each when we got home (Michaela Byrd wisely choose candy that came in multiples), and T and I siphoned off some from our own ToT bowl...turns out we had some leftovers. I can't believe it is November already. I have some serious Christmas shopping to do, but some seriously cute projects to share with you all...whenever I find the time to blog them! What happened in your neighborhood last night? Any funny Halloween stories? The girls look absolutely adorable in their costumes. What fun you had! Halloween is much more interesting with little kids than with big ones! That is just stinkin' adorable! And I love the candy bags. Cute! 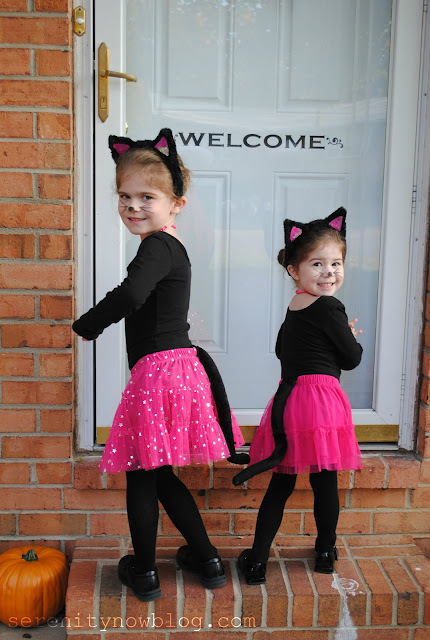 Seeing your darling girls reminded me of when I dressed my 2 daughters as a black cat and a white mouse for Halloween (ages ago)! Oh, they looked soooo cute!! Love that! And the thing about yelling stop, drop, and roll...too funny! Oh my goodness, what cute kitties! They looked adorable! Glad they had a fun night. AW! Your girls are too cute!!! Love their little kitty costumes! We had ZERO trick or treaters last night... Oh well! your girls are so adorable!! i love the matching costumes. Your four trick-or-treaters are adorable. Love the cat costumes and it's great that the leotards can also be used for dance. Your niece's wig looks real and makes me chuckle every time I look at her photo. Adorable, adorable. Looks like you guys had a fun night. :) We had the former owners' kids show up trick-or-treating at our house...we recognized them from all the family photos that had been up on our multiple walk-throughs. I guess they didn't move far! Those are some cute little kitties you have there! Looks like they had a great time!